Low-Income Tenants Struggle To Pay Rent Most people who end up facing eviction simply can't afford to pay their rent. 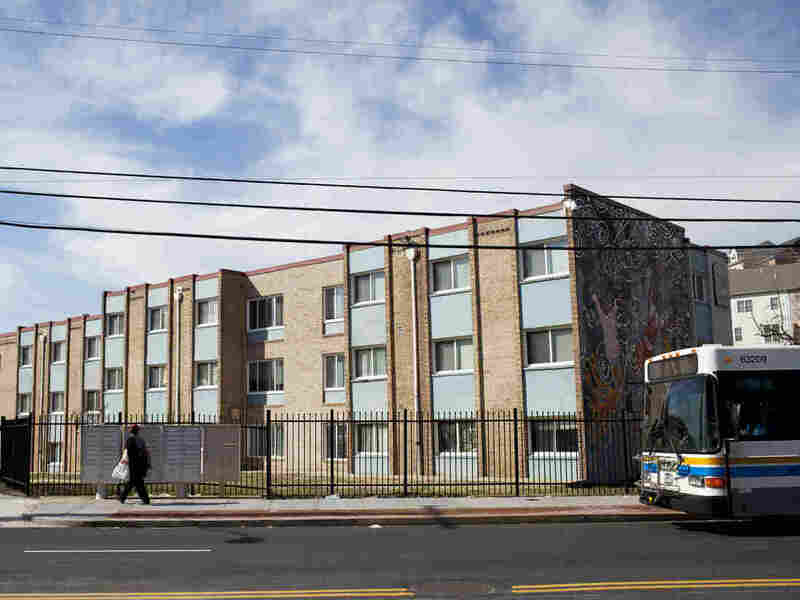 Many low-income tenants work, but their rent outpaces their wages. An unexpected bill or a lost job can mean homelessness. Meagen Limes of Washington, D.C., is struggling to pay rent on the apartment where she lives with her 4-year-old son and 8-year-old daughter. "And it's like really scary," the 28-year-old said. "I try so hard not to cry. Like, I would be like, 'Oh my God, if they come today, what am I gonna do?' "
I first met Limes outside the courtroom of the Landlord and Tenant Branch of the Superior Court of the District of Columbia, where tenants go when they've been sued by their landlords for not paying rent. That day, a judge ordered a writ of restitution — directions for the marshals to begin eviction proceedings. Limes wore a black apron and purple shirt with the logo of a local grocery store where she works part time. When the judge asked why she owed more than $3,300, Limes said she was struggling to make ends meet. "And basically he was like, 'So the only reason why you're behind on rent is because you can't pay rent?' And I was like, 'Yeah, that's the only thing,' and he was just looking at me like, he said, 'We'll send out a writ,' " Limes recalls. "And I was just like, 'Wow, like, is there any way I can get some help?' "
Limes is among the hundreds of thousands of Americans who face eviction because they simply can't afford their rent. One in four low-income families pays more than 70 percent of its income on rent, leaving little money for other bills and almost no room for an unexpected expense. According to the Harvard Research Center's State of the Nation's Housing report in 2015, rising rents and stagnating wages nationwide have contributed to a record number of cost-burdened renters — a situation that is worsened by the shortage of affordable housing for low-income tenants. Limes lives with her 4-year-old son and 8-year-old daughter. Her ailing father had been living with her, too, until he died recently. "I also have my niece. She's 18 and she's been going from house to house," Limes says. "So I told her just come stay with me until she get on her feet." Their apartment feels like someplace people are just passing through, with empty walls and plastic bins stuffed with clothes on the floor. Limes is pretty typical of those who end up in rent court: She's a single mother, juggling things on her own. She says the father of one of her children is in prison and the other is a deadbeat dad. 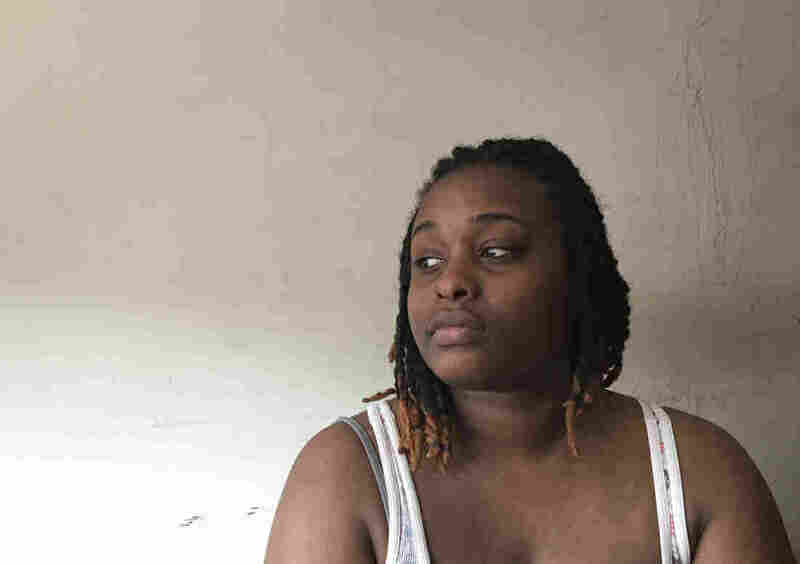 She lost a full-time job last October; her new job is only 20 hours a week. At $10.50 an hour, that's not nearly enough to cover her $1,275 monthly rent. "They're living on a very tight margin," says Judge Judith Bartnoff, who presides over the D.C. court that includes the Landlord and Tenant Branch. "And if something happens, if somebody gets sick, if somebody gets hurt, if somebody loses their job, then it throws the whole system off." She thinks many of the thousands of tenants who come before the court each year can afford their rent at some point — but just barely. Limes' monthly rent is $1,275 for a three-bedroom apartment at The Village at Chesapeake apartment complex in Southeast Washington, shown here. The hallway outside the landlord tenant courtroom is routinely packed with renters who are trying to work out deals with their landlords' attorneys. Some offer payment plans so a tenant can catch up, but many renters just agree to move out. Or, like Limes, they resign themselves to eviction, which can make things worse. "It really drives people deeper into a state of hardship," says Matthew Desmond, a Harvard sociologist who spent more than a year following low-income renters and landlords in Milwaukee that he details in his new book, Evicted. Desmond says evictions are not just a result of poverty but a cause. It makes lives more unstable. People don't just lose their homes in evictions, he says. "But you often lose your neighborhood and your school. Children often have to switch schools and miss long stretches," he says. Families often end up in areas with more crime and poorer-quality housing, Desmond adds. Limes says she is worried about that. She wants to move, but even studio apartments are $800 a month, which she can't afford. "It's like I'm stuck here. I don't know where else to go. I don't want to go to the shelter. I'm trying to get help. But I can't find help anywhere," she says. She did get some temporary aid from the city a few years ago, but permanent housing assistance is almost impossible to find. Limes applied eight years ago for housing vouchers to help cover her rent. "And nothing. I'm still what, 1,000 something," she says. That's No. 1,000 on the waiting list. In fact, the city recently shut down the list because more than 70,000 families were on it. Only one in four people in the U.S. who qualify for public housing or vouchers actually gets them. 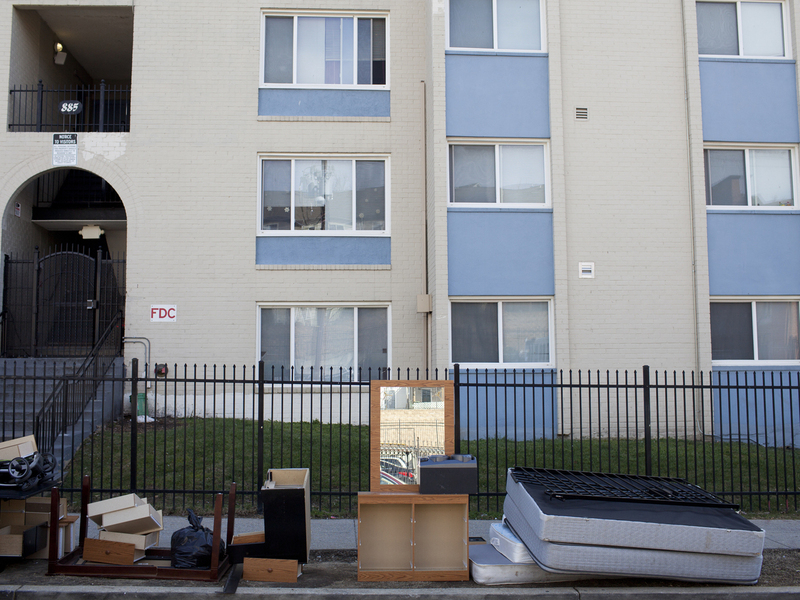 Personal belongings and furniture piled up outside Limes' apartment complex during one of two evictions that took place on March 3. Five weeks after my first visit with Limes, furniture was piled on the curb outside her apartment complex. There were mattresses, CDs, a flat-screen TV. Two other families had been evicted that day. But Limes was still waiting, worried that she and her kids would end up back in the city's homeless shelter where they were in 2012. "It was hard, and it's like it was disgusting. And I don't want to put my kids in that situation again," she says. A week later, Limes got a reprieve — but only a temporary one: She received her earned income tax credit check from the IRS and was able to pay off what she owed. She still has to worry about next month's rent. This story was produced for broadcast by Evie Stone.